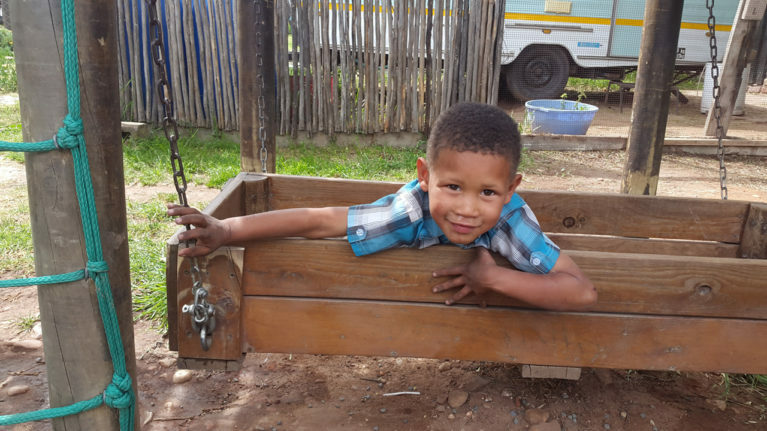 I had no idea what I would find in the township of Oudtshoorn, South Africa. However, I was excited to visit the place which our expedition leaders and past volunteers had always told us to be a highlight during their South Africa Trip. 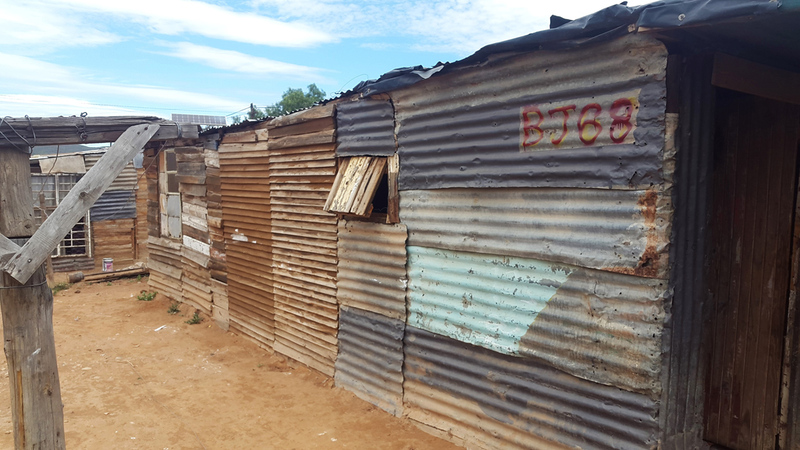 Since our expedition leader Barney initiated the cooperation between Gapforce and the St. Luigi Scrosoppi Centrum in early 2015, we have heard great things about the impact of our community project in Oudtshoorn. Now it was finally time for a project visit! Arriving at 9am in the morning, Thapelo took the time to show me around the centre. 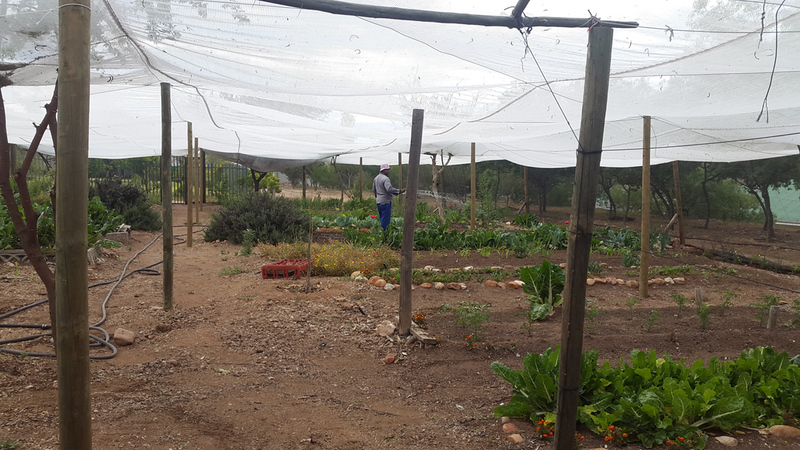 It truly is an oasis in one of the poorest parts of the Western Cape. The vast land it stands on – once one of the town’s worst slums a decade ago – now serves as a safe haven for abandoned children. Thapelo was one of the first youngsters in the centre. He is still there, however these days as a fulltime employee. We pass veggie gardens, a small garden with peacocks and geese, accommodation for the nuns and monks, the volunteer house, the playground and the small chapel. We then walk up a staircase that has exactly 59 stairs – just like a Catholic rosary. Arriving at the top, a beautiful view over Oudtshoorn’s terrific landscapes awaits me. In the distance I spot the many frail looking sheds, put together by wooden or tin panels. Most of them are not insulated at all and do not offer any protection from the elements. Back in the main house, I meet two women who are responsible for cooking a hot meal for the kids every day after school; Actually, if they were in school. I quickly find myself peeling potatoes, lots of them in fact! I have never peeled so many potatoes in my life – 40 hungry children have to be fed later on in the afternoon. I see the volunteers sitting outside and preparing the games they plan to play with the kids this afternoon. Then an idea pops into my head! We can play rounders! I still remember the game from my own time at school and as we will see later, it would be a great success with the kids! Two boys, maybe 7 or 8 years old, have been hanging around in front of the centre’s gate for hours- Garbage lies around them everywhere. Their clothes are covered in holes and they don’t wear any shoes. Asking them why they are not wearing shoes, the answer is “gebroke”, which means broken in Afrikaans. Obviously they didn’t go to school today. We will get to know Brendan, one of the boys a bit better later. After having lunch with the volunteers, Thapelo wants to show me the centre’s Kindergarten. The Kindergarten is led by nuns, as well as pedagogic staff for kids with special needs. It is beautifully decorated, colourful, with toys everywhere. As soon as we step in, the kids between 2-5 years come running towards us. They are fascinated by my hair. One of the staff members tells me that this place was opened for children that either need continuous medical treatment or have a disability. Almost all children I see were born with the so called Fetal Alcohol Syndrome, which is caused by excessive drinking during pregnancy, others had to detox straight after being born, due of their mother’s drug addiction. A little girl shows me a picture she just painted. Mary, one of the Kindergarten teachers, says “She is almost done with her tuberculosis treatment“, and gives her a hug. Around 2pm Annie who is one of the centre’s founders, shows up at the centre. She says: “Get in the car. I am going to show you the house the Gapforce group insulated last week”. We drive towards the sheds I saw earlier from the hilltop. There is garbage everywhere, sometimes scattered, sometimes piled up. 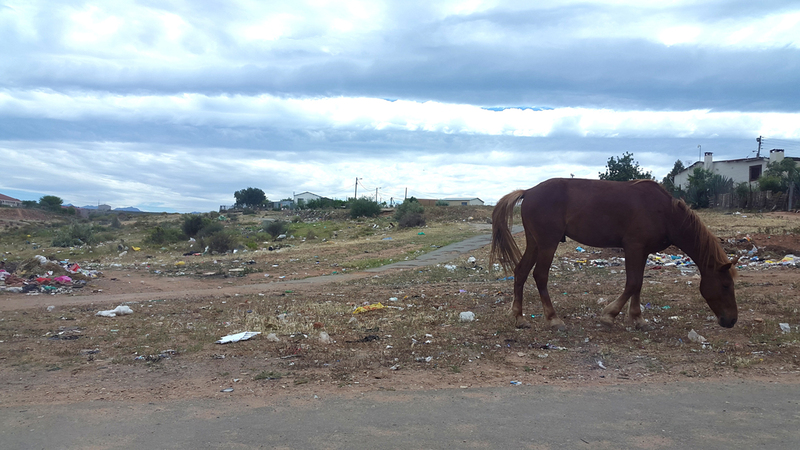 At some point I see a horse trying to find a few blades of grass in between all the plastic bags and bottles. 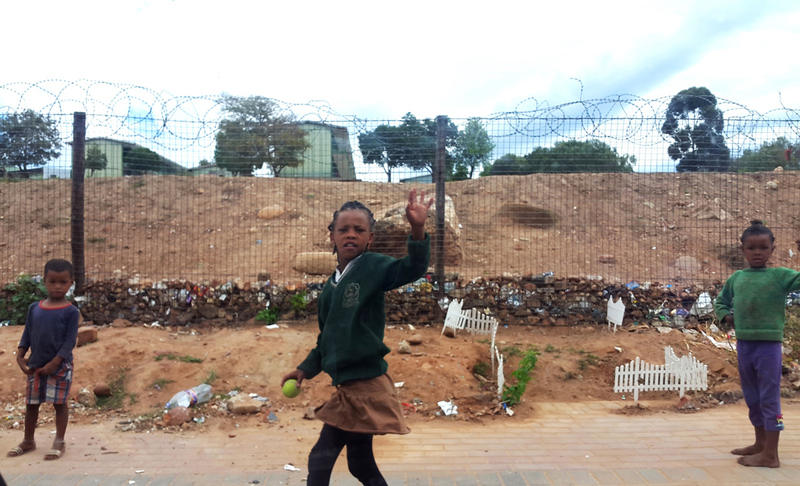 Still driving through the “better” part of the township, we see some kids coming home from school. We then take a turn to the left and pass people looking either apathetic and kind of out of it. Others are talking and gesturing to themselves. The drug addiction, written all over the face. Some people, however, also wave to Annie. They all know her. Finally we arrive at a wooden shed. The small garden is fenced and there is a toilet outside. This is more than most people have here. 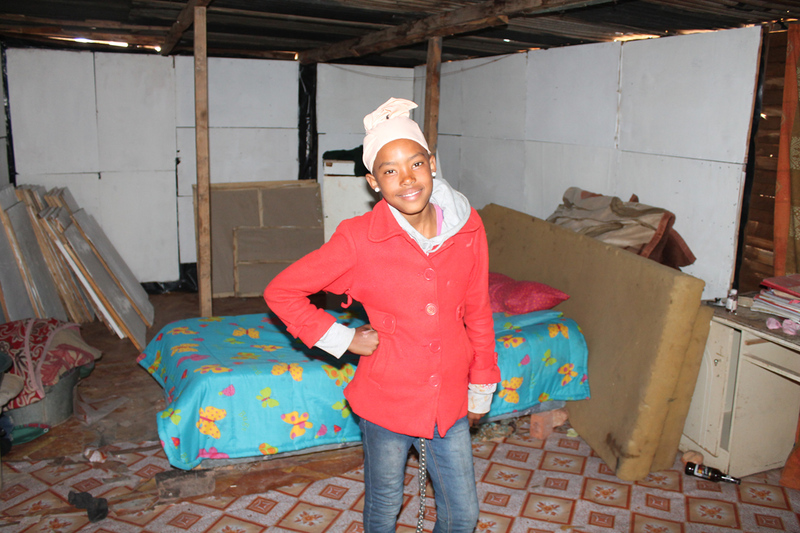 Danisa, 12, living here with her two siblings greets us at the door. Asked why she is not in school, Danisa shows us her hand, which she seemed to have burned accidentally with the kettle. We walk in. The shed consists of one room. There is a bed in the middle. Annie shows me the white insulation plates which were mounted on the walls by the Gapforce volunteers to keep wind and rain out. While there is still no running water or electricity, the volunteer work by Gapforce has clearly helped a lot. I thank Danisa and tell her to go to school tomorrow. She probably won’t. Arriving back in the centre, the first children arrive. Today there will be around 40 kids between the ages of 5 and 14. First, everyone has to wash their hands in a bowl of warm water and soap. I also see Brendan again as one of the volunteers hands him new trousers as his ones are ripped. ”Unfortunately, his mum often sells the new ones for drugs” she tells me. Brendan and a few others continue to play whilst waiting for their food. I have already had lunch with the other volunteers and, it was delicious! The last part of the day: Rounders! We leave the playground near the main building and go down to the lawn. This is the highlight for the children and within a few minutes everyone understands the rules and the first boy throws the ball. 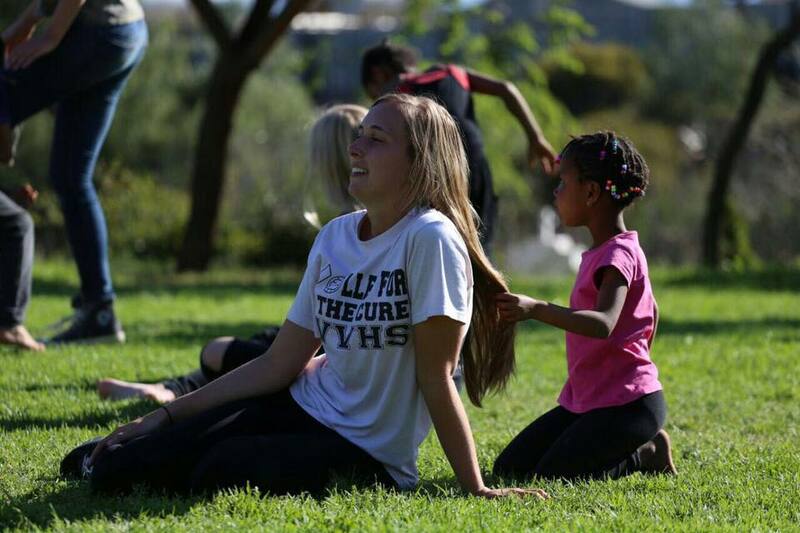 Are you thinking about volunteering in a daycare centre in South Africa? We’d love to hear from you and answer any questions on your mind. Gapforce run independently inspected and award winning expeditions, outdoor training courses, volunteer abroad programs, conservation and aid programs. From 2 weeks to 1 year, your adventure starts here!